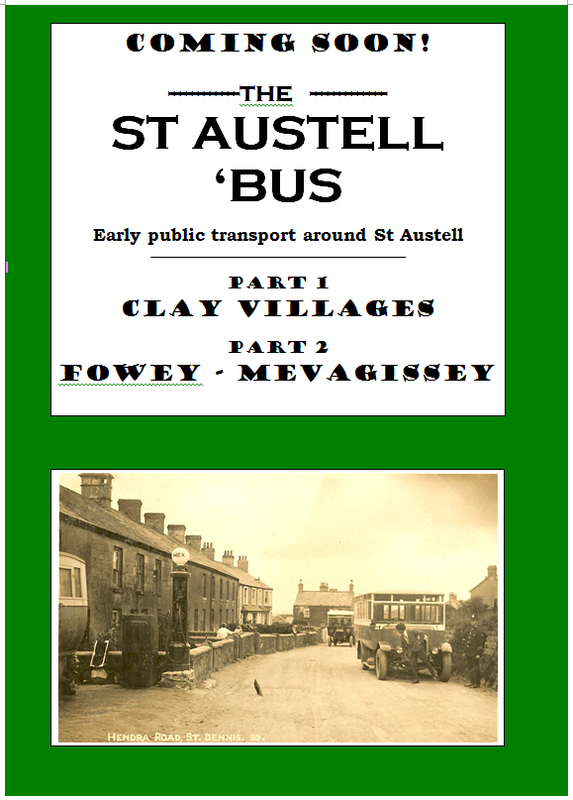 Coming Soon: The ST AUSTELL 'BUS Pt1 & Pt2!!! The story of early public transport around Exmouth is a tragedy of several parts. But not all was doom and gloom. Read about the development of Arcadia, Blue ‘Bus Service, Enterprise, Harris’s, Millers, Payns, Burbury’s Royal Blue and others. Motor Trams and Toast-racks along the sea front and passengers like Mrs Pushy-Shovey. First published in the 1990’s, now in a revised edition. Tells the story from the steam ‘buses of 1911 through the 1920’s when competition led to a fare of 1d (one old penny) between Newton Abbot and Kingsteignton. Includes the little Blue ‘Bus, Newtonian, Pride of the Moor, Speedwell and others. “THE LISKERETT ‘BUS”. Early public transport around Liskeard. 17 operators including M.G. Rowe of Dobwalls, manufacturer of Rowe Hillmaster vehicles, and Truscott Bros of Rillamill, who expanded into Liskeard and Launceston. Also “Liskerrett”, “Blue Boy”, “Trehawke” and Western National in the area. 35 photographs, maps, time tables, adverts and lists of vehicles. Our aim is to share the results of our research and we endeavour to keep prices affordable. However, increases in printing and a dramatic rise in postage rates make life difficult. It now costs 50p postage to tell you about books and at least £1 to send them. Regrettably we must in future ask for a £1 contribution to postage and packing. This will apply to each order, no matter how many books are required, as the cost for two or more volumes is not significantly greater than for a single book. We hope and believe that this still represents good value for money. One way of reducing costs is using e-mail and internet. Notification of new publications can be sent electronically rather than by “snail mail”. Our son and grandson decided that we needed a website and thanks to their efforts you can now order on line and pay via paypal if you wish. We hope that some of you will find this helpful. If you prefer to continue by post that is fine. Lastly thanks to everyone for loyal support over the years. We are grateful for the help and encouragement as we endeavour to record an era now long gone. Horace Barber and Eddie Shergold joined Sparrow & Vincent (“Victory”) of Salisbury on completion of their apprenticeships. After this firm was acquired by Wilts & Dorset they became partners in Skylark Motor Services. Doubts were raised locally about whether Skylark vehicles actually ran through to Lyndhurst. Thanks to Brian Biddiscombe, who rode on the ‘buses at that time, it is clear that the company’s double-deckers did operate through journeys to and from Salisbury. Buddens had been working with Skylark for some time before they bought the latter. With autumn almost upon us it is time for more titles. “THE LISKERETT ‘BUS” will be published early in September 2012. It covers early public transport around Liskeard, including well known operators like M.G. Rowe of Dobwalls, famous as the manufacturer of Rowe Hillmaster trucks and Truscott Bros of Rillamill, who expanded into Liskeard and Launceston. In total the stories of 17 operators are covered and there are pictures, maps, time tables and lists of vehicles owned. Read all about the “Liskerrett”, the “Blue Boy” and the “Trehawke” as well as notes on Western National in the area. At the same time a second edition of “CHAGFORD AND CREAM” will be available. This is the story of A.E. Thomas, a member of a family of Witheridge carriers, who moved to Chagford to run his own business. Also included is the tale of early railway ‘buses – the town was served by both Great Western and the London & South Western companies – and the other local operators. After the Second World War Mr Thomas bought Cream Cars at Torquay and the story continues until his death in the late 1950’s when the business was sold to Wallace Arnold. Also in the pipeline is a “DIRECTORY OF DEVON MOTOR ‘BUS SERVICES” in 1931. This will show all routes operated in the early part of that year, just before the introduction of Road Service Licencing. There will also be current fleet lists of all independent ‘bus operators and many illustrations and maps. At the same time another second edition will be available – probably “LUNACY AND LICENCING”, covering the Tiverton area. If you are interested in any particular area(s) or operator(s) in Cornwall, Devon, Dorset, Somerset and Wiltshire do please get in touch. We will do our best to help. For those of you who were looking forward to reading a post by Roger I'm sorry to disappoint, but this is one of his younger grandchildren, Billy. As a gift for Roger, me and my Father decided to put this website together to provide a proper arena for Granddad to make his publications available to a wider audience. I have always been immensely proud of the shear number of books Roger has written over his lifetime. I must admit however, that it wasn't until I began working on this website that I truly took the time to immerse myself in his world, the world of public transport and social history. In order to get a real idea of how the website should look and feel, as well as to understand the target audience a little better I settled down one afternoon and began to pour through my own personal collection of Roger's work. I found the stories of the lives of those first few pioneers of rural transport to be highly moving. The passion and determination with which they decided to approach the provision of public transport was admirable. For me the biggest realisation to come from reading Roger's work was how much these buses had changed the lives of those who lived in the hamlets and villages of the south. Having grown up myself in a time where public transport has been replaced by the personal car I always took for granted how easy it is to travel relatively long distances with little planning. The bus is now such a pillar of our society that their removal would cause outrage. It's easy to forget though, that until relatively recently the creation of a new Omnibus route would have been the talk of the town! It's not just the freedom and mobility that these vehicles represent either. Scanning through the images and records there is a real beauty in these machines. My personal favourite has to be the 1949 era Leyland Tiger. For me this bus represents a time when form and function seemed to seamlessly integrate with one another and produced machines that wouldn't look out of place in an art gallery. It is however pretty obvious that the addition of lots of chrome was a fairly new practice as nearly all these buses carry more shiny decoration than even the most enthusiastically decorated Christmas tree! Thank you all for taking the time to visit the site, Normal service will resume with Roger taking over the mantle of main blogger in the next few weeks.